Our inspiring founder Olga Murray still travels to Nepal every fall at age 93. 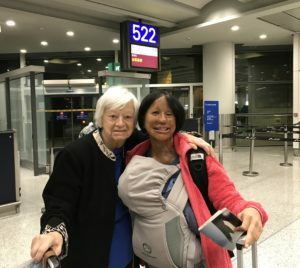 This fall, her return to Kathmandu for the holidays was extra special because she went with Durga – the eight year old she brought to the US in 1993. As an infant, Durga had rolled into a fire and suffered very serious facial burns. Her family invested everything they had — even her mother’s dowry jewelry — into Durga’s medical treatment following the terrible accident, but in Nepal the options for reconstructive surgery were extremely limited. Durga’s life changed dramatically when Olga arranged for a consultation with plastic surgeons in California. Some of you may remember Durga as “Anjita” in Olga’s Promise (see excerpt below): her bravery facing repeated surgeries, her early life with dear NYF friends Joanne and Tot Heffelfinger, who raised her as their own – and her evolution from a tiny 35 pound firebrand with no English and totally unfamiliar with western life – to the smart, warm-hearted, charming young woman she is today. Durga and her husband Scott married three years ago in Marin County, California with Olga as their officiant. She walked down the aisle with her father who traveled all the way from Nepal. On Durga’s other arm was Dr. Angelo Capozzi who performed all 30 of the surgeries on her face. There wasn’t a dry eye in the house. Last April, Durga gave birth to an adorable little boy. 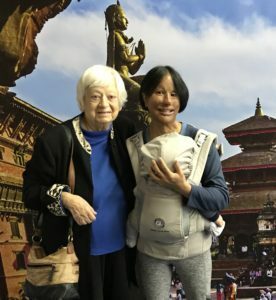 With the wonders of technology, she’s remained very close with her large Nepali family and was eager for them to meet her son, and to give and get Dashain blessings. It was a grueling trip – 15 hours to Hong Kong, and then a 12 hour layover before the six hour flight to Kathmandu. Durga and Olga were exhausted, but the considerate baby slept most of the way. 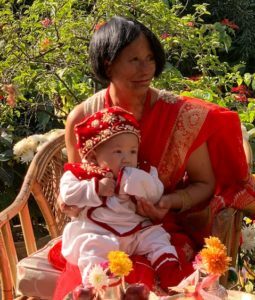 After Dashain, they also joyously celebrated the little boy’s “rice feeding ceremony,” the time a child first eats solid food – usually a couple grains of rice. It was a very festive occasion, with a healthy contingent of Durga’s relatives in attendance. The special satisfaction of the long-term impact of NYF’s work makes us all even more grateful to all of you – the NYF family of supporters. Your generosity makes all of our work possible. I’ve been to Nepal and Katmandu and can tell you – Olga and her foundation, the Nepal Youth Foundation are the real thing. One of the children I talked with considered the accident that badly burned his hands and arms a stroke of good luck because it got him to Olga! This world needs more Olgas. Thanks so much for your kind words and sharing the story of the boy you met — wow! We’re so grateful for your long term support to help make all of our work possible! It’s an outstanding story… we all need a hand as Olga did, but also give a helping hand to someone! Thank you, Didier! What a great way to put it. We’re so grateful to have you in the NYF family helping to make these kinds of successes possible! My husband and I toured Olgapuri last year, and we were so moved and inspired by all of the ways in which Olga and her organization help disenfranchised Nepali youth. It’s hard to put into words how courageous and creative and compassionate Olga is. And what makes her special is that she has directed her empathy and intellect in powerfully transformative ways. She has empowered thousands of young Nepali’s to love themselves and live their lives at their fullest potential! If you are inspired I encourage you to support her work, read her book and maybe even visit Olgapuri yourself. You will be forever changed.